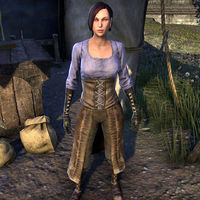 Hilaria Aubertin is a Breton weaponsmith who runs The Adventurer's Edge in the Alcaire Marketplace in Alcaire Castle. If spoken to, she will say, "Out traveling and exploring, are you? Let any evil-doer or riled up creature know you mean business with a finely-crafted and sharp blade!" This page was last modified on 21 December 2018, at 08:06.